Mahoney Asset Management is a results-orientated team of professionals, supported by a disciplined investment strategy, dedicated to helping you achieve a comfortable retirement. We work to provide you with the highest quality retirement planning and portfolio management services. If you’re already enjoying your golden years, our team offers Retirement Success: Financial Security in a Changing World. This program, reviewed and approved by The National Council on the Aging, Inc., is the first designed specifically for retired investors. Mahoney Asset Management and this program will help you meet your new financial responsibilities and guide you to appropriate investment strategies. You will receive a financial-security analysis, an income-tax review, a cash-flow analysis, an estate-planning profile, an annual financial check-up, and a periodic newsletter all at no cost or obligation. Mahoney Asset Management offers securities through Aurora Capital LLC which is a member of the NASD and Securities Investor Protection Corporation (SIPC), which provides coverage for accounts up to $500,000 (including up to $100,000 in cash) per client as defined by SIPC rules. Aurora Capital LLC clears its transactions through COR Clearing which provides additional account protection through Lloyd’s of London up to $24.5 million (including up to $900,000 in cash) per client as defined by SIPC rules. With both SIPC and Lloyd’s of London coverage, accounts are protected up to a total of $25 million per client (as defined by SIPC Rules including up to $1 million for cash balances.) This coverage does not protect against loss of Market Values of securities. In pursuit of achieving his clients’ unique financial goals, Ken Mahoney specializes in investment management, combining his abilities with the resources of Aurora Capital LLC and COR Clearing to provide the highest quality, most comprehensive total financial planning package. Ken established Mahoney Asset Management to provide a comprehensive array of financial planning services, designed to help you maintain your desired lifestyle throughout your golden years. With the goal of becoming your primary financial advisor, he embraces a time-tested approach that seeks to help you achieve your goals, while reducing risk through proper asset allocation. An accomplished financial advisor, author, and speaker, Ken brings over 24 years of professional experience to the residents of Rockland, Westchester and the New York City metropolitan area. He also often appears on National Television. He is a guest financial contributor on ABC, CNBC and WPIX and a Guest Financial Analyst on Fox Business News and EBRU TV. Ken’s opinions on the world of finance have been published nationally. He sat on the Advisory Board of the House of Representatives Banking and Finance Committee, has taught finance at Dominican College, and won 2001’s annual “Stock Picking” contest held by Gannett Newspapers. He is a frequent guest speaker at business associations, senior groups, corporations and other organizations throughout the region. Prior to founding Mahoney Asset Management, Ken was Senior Vice President and an Investment Officer with a major brokerage firm. Ken’s expertise has not gone unnoticed by periodicals either. Ken’s market comments and perspectives are published in the Hudson Valley Business Journal weekly and his financial opinions have been published by USA Today, as well as by various other local publications. He is a familiar quoted figure in the business pages of newspaper’s Business Leaders Roundtable. Since 1992, Ken has published the financial newsletter, The Smart Investor. He also did a market report on Tuesday mornings on WHUD, and can currently be heard live week- day mornings on WTBQ 1110 AM or 99.1 FM at 7:30AM and WRCR 1300 AM at 8:30AM. Ken is the author of Investing From Within: A Story of Under- standing, Now What? A Guide to Retirement During Volatile Times, Can I Retire? and A GPS For Your Retirement. His latest book, A Tale of Two Retirements, released in 2014, will lead investors to their best retirement choices. Ken also launched a series entitled The Zoo Exchange: Teaching Our Kids About Money, which teaches children financial principles. 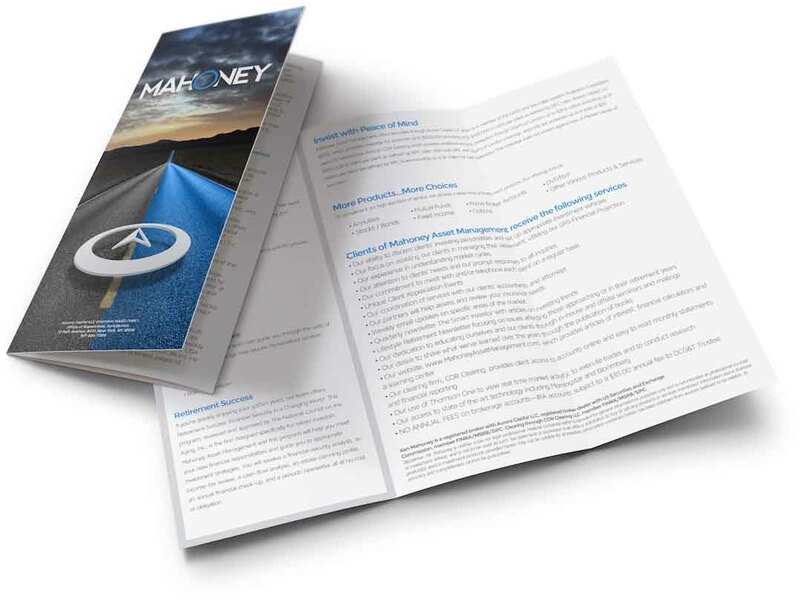 Mahoney works with it’s clients to provide the highest quality retirement planning and portfolio management services by creating a road map, otherwise known as a GPS projection, that guides people through the difficult to navigate landscape. Click to download Ken Mahoney’s professional services overview in order to start down the right path to retirement today.